Leading scorer Dan Thompson got back on the goal trail with a first half double as Rothbury went top of the table on goal difference. With Tony Brown and Gareth McCann also stretching the net before the break, the Reds had done the damage and defended resolutely after that to claim three important points in a game that the referee almost abandoned at one point due to a hail shower. “We knew that the second half would be difficult against the strong wind and a tenacious Jesmond side but I thought we controlled the goal really well and defended excellently at times, limiting them to long range shots,” said player coach Tom Macpherson afterwards. 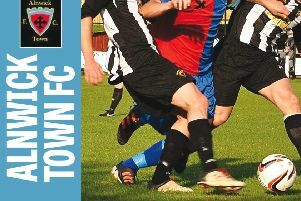 Although Andy Hall cancelled out Brown’s brilliant tenth minute opener, Rothbury raced back in front with three goals in six devastating minutes. Stewart Wright pulled another back for the hosts shortly after the turnaround. Stobswood did the Reds a huge favour by beating Whitley Bay SC 2-1 while Spittal Rovers were 2-0 up at the break against Blyth – but the visitors notched six in a storming second half to blow the title race wide open. Herron hailed Thompson’s contribution as ‘great’ and picked out his second goal – running at pace from the half way line before jinking inside a defender and curling it into the corner – as the pick of his brace. “It was a great win against what could easily have been a banana skin to be honest,” continued Herron. Rothbury have a huge fixture against third-placed Whitburn & Cleadon at Armstrong Park on Saturday, kick-off 2.30pm, and this is followed by games against Whitley Bay SC (home) and Willington Quay Saints (away). “We have three massive games ahead to finish off March which could really define our season. But it’s exciting times ahead and the lads are loving the ride at the moment,” added Macpherson.